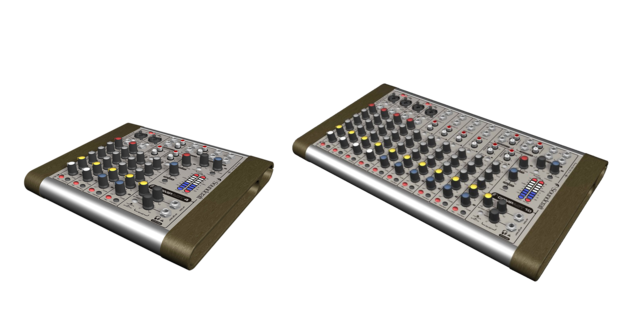 The Soundcraft COMPACT 4 mixer is perfectly suited to many applications requiring simple mix facilities, but it comes into its own when used for recording vocals and music onto computers using a soundcard. Several features have been specifically incorporated for this. Firstly, it’s simple to route an input straight to the record output simply by selecting the RECORD button on the channel. Secondly, a wide variety of input sources are catered for on this simple 4-input mixer. These include microphone, line, and a special ‘DI’ or ‘Direct’ input for guitars and keyboards, plus stereo inputs for keyboards, CD/tape, or turntable (with RIAA equalisation). This DI input matches the input impedance of the mixer to the output impedance of the instrument, ensuring optimum professional-quality audio capture. Thirdly, listening while recording is made easier thanks to a special blend control that allows you to control the mix of the computer playback mix and the signal of the track being recorded which are blended for the Artist headphone output. Using an external analogue mixer for computer recording means zero-latency monitoring. That is that you can listen to your track being recorded simultaneously with the playback from the computer, without the inherent signal delay of the computer soundcard and host processor. A larger model, the COMPACT 10, features 4 mono and 6 stereo inputs, with additional line input ¼” jack sockets on 4 of the stereo inputs. Other standard features on the COMPACT include 3 band EQ on the inputs, along with professional 48V phantom power for condenser microphones, dedicated balanced and unbalanced Record and Playback connections, independent engineer & artist headphone outputs, and monitor outputs. The dual headphone feeds provide a level of monitoring normally found in large commercial studios. All monitoring is in true stereo, rather than the mono-summed monitoring found on competitive products. This means that what you hear is always as it will be in your final master.